models—which may cause you to pick up the X-Acto knife and start building a new minimum-space layout! 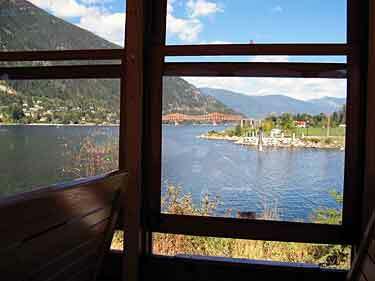 Keeping an open mind, take a look at some railways that are Off the Beaten Track. [Ed. Note: Many of these prototypes are described on their own web pages, illustrated with copyright photographs. To experience them fully, click on the provided links and examine their sites in the new window that opens. 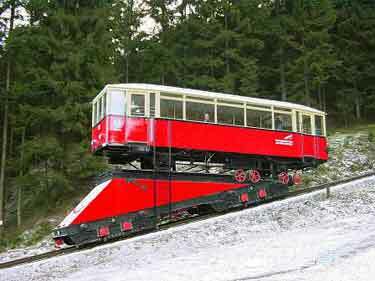 One of this site’s contributors introduced me to the Oberweissbacher Bergbahn (“Oberweissbach Mountain Railroad”), a unique funicular line in Thuringia, central Germany. Neil Rushby, from York, England, heard about the line from his friend, Steve Pearce, who visited it. “There’s a huge amount of inspiration for the fan of the weird and whacky,” writes Neil. “Check out the ‘position plans’ of the upper and lower stations, both would make good micro models. The upper station has no points, just a turntable.” And the turntable (upper right) is used daily in regular revenue service! And there’s more. 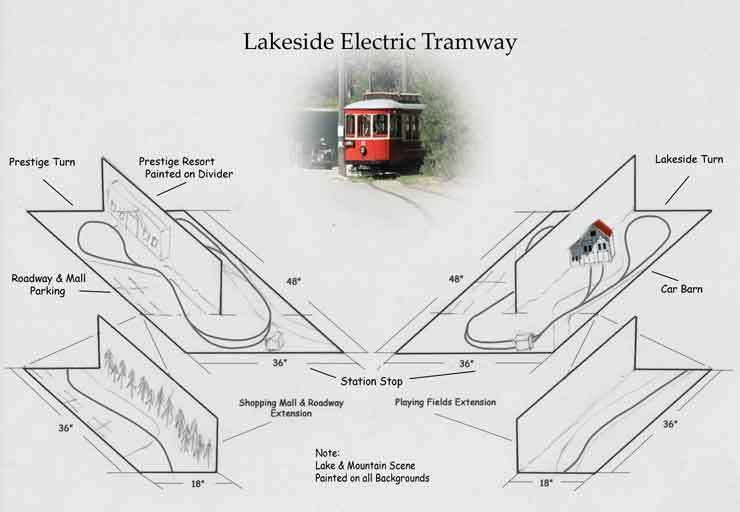 The line uses two kinds of passenger vehicles (shown below) — a regular, diagonally-oriented funicular car (right) and a former freight-car transport platform, now used to haul a passenger-carrying railcar! 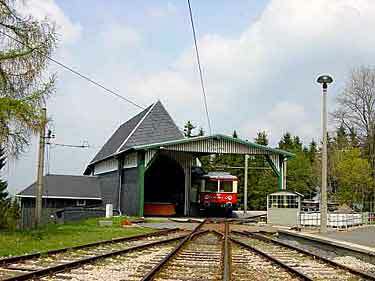 The lower station (upper left) has two terminals, one for the passenger funicular car and the other for the goods platform. There’s a passing siding (loop) in the center of the line, and the upper station has no turnouts at all, just the multi-purpose turntable. In the frigid South Atlantic, stretching “from the Andes to the Antarctic,” is a chain of several hundred islands called the Scotia Arc, including the Falklands and South Georgia. This inhospitable but strangely beautiful part of the world was home to a clutch of narrow-gauge railways serving the largest of the many whaling stations established on their lee shores in the 19th century. The whalers unloaded their catches at the station, where the meat and blubber were processed, rendered, and packed. The railways, mostly two-footers, moved products and supplies around the properties and out to the piers for shipment. 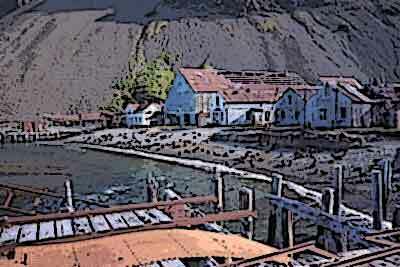 Although the whaling stations are now largely deserted and falling down (see artist’s rendering at right), there are still many traces of these hard working little railroads. Ben Rechel, from West Hartford, Connecticut, USA, called my attention to the remnants on South Georgia with photos at “Railways of the Far South” (page 11) and “South Georgia Pictures”. Ben was inspired by these shots to design a small HOn30 whaling-station railway, which he called Deception Island (a real place, but with a different track arrangement). “I see the motive power as being an 0-4-0 Porter or maybe a gas critter. The rolling stock could be a couple of skips for coal to go to the boiler house and power station, a couple of flatcars for transporting blubber, bones, etc., and maybe a tank car or two for moving whale oil and diesel fuel around,” Ben comments. The layout shown here, Deception Island Whaling Base, is a simplified and reduced-space version of Ben’s original, more complex design. It has good operating possiblities, like his original. The little railway is used to bring supplies inland from the pier, move whale materials around the site, particularly to the blubber boiling plant in the center, where the blubber was rendered into whale oil. This little line, set on an island 80% covered by glaciers, provides a very unusual setting for an excellent working model railroad! While exploring the Virginia countryside from his home near Washington D.C., Thomas Van Hare happened upon the town of Bluemont, in the foothills of the Shenandoah Mountains. 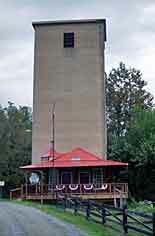 He noticed a grain elevator tower (above right) that reminded him of other such elevators he’d seen farther east on the Washington & Old Dominion Railroad Trail (a “rails to trails” project). Taking a closer look, he found that the Bluemont tower was located on Railroad Street, and was next to a now-delapidated structure that looked like a former freight house. And there’s the makings of a railroad museum next door (far right above). And so it does. I’ve taken the liberty of making a scale drawing (below) from Thomas’s original sketch. I added a three-foot shelf to the corner triangle to provide a 26-inch sector plate, allowing three-coach trains to arrive at Bluemont Station carrying sweltering D.C. residents to the cool mountain air. There’s also some freight switching available, from the grain elevator and freight station as well as the industries in the corner at the top. The switching is somehow sandwiched in between arrivals and departures of the varnish. 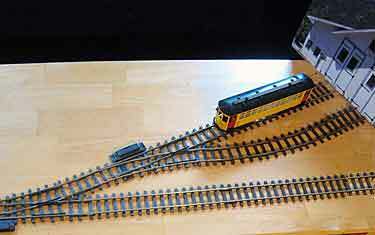 To fit in this space, the layout uses Peco Set Track, with about 15-inch radius curves – very workable with Turn of the Century rolling stock. © Copyright 2007 SPG Media Limited. Canadian Dave Walker provided us all a new look at the familiar theme of mining railroads, in the following communique: “I used to work at a Canadian gold mine which had a headframe layout shown in the attached sketch (top right). 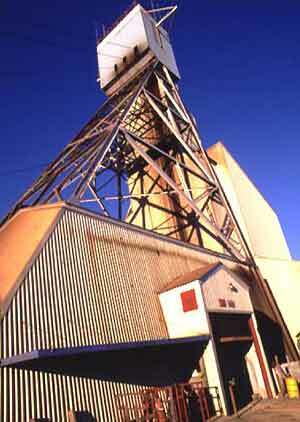 The photo shows the exterior of the headframe, with tracks just visible in the doorway. 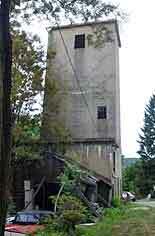 In less modern times, of course, the 2ft [60cm] gauge tracks were more extensive, but every type of rail equipment used passed through this headframe on the way underground — battery locomotives, wet cement in tipper skips, air-powered mine loaders, the inevitable latrine cars, and of course, explosives cars. The cage was a smaller type, which would only take ‘cager’ type lokeys and two-ton cars, like these. Anything bigger was disassembled and shipped down in pieces, or slung underneath the cage. 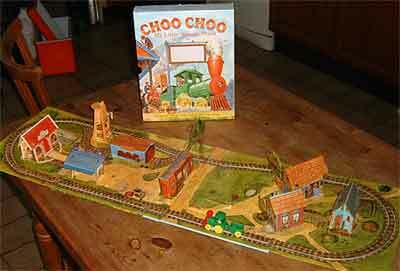 And there you have it … a ready-made plan for a micro layout in a box! Dave also pointed out, however, that in less frigid climates than northern Ontario, all these structures could be in the open rather than enclosed. So I have also drawn up an open-air version of the mine. 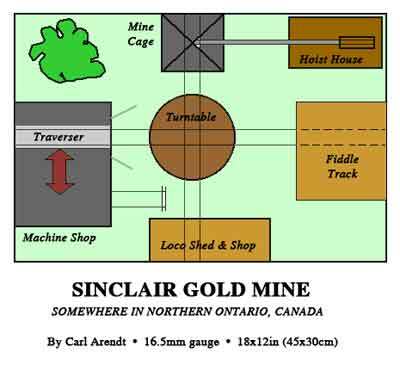 As Dave’s mine was called the Campbell Mine in Red Lake, Ontario, Canada, I’ve named this version after a different Scottish clan (which happens to be my wife’s). Operation is the same, with stock entering from the shop (after repairs) or from the outside (fiddle yard), and being taken to various appropriate destinations. 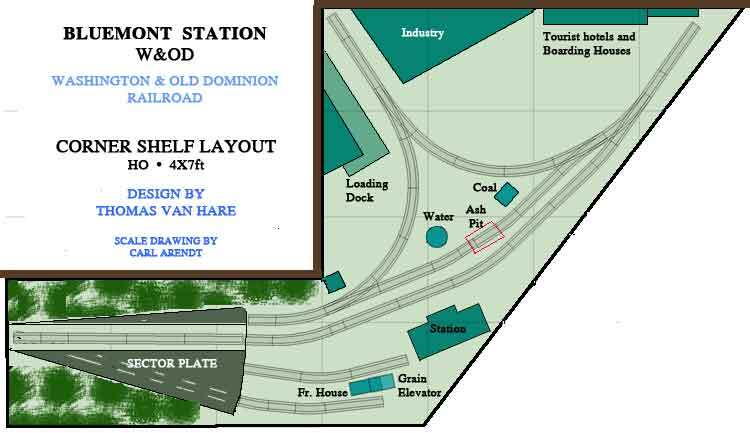 Andy Anderson, from Southampton, England, sent along a sketch of the east terminal of the Hastings Miniature Railway in Hastings, England. Andy observed how remarkably apt this little 10¼in [260mm] gauge railway is for adaptation to a micro layout! There’s even a built-in fiddle yard, in the tracks that double back into the building that straddles the “main line” as it enters the terminal. 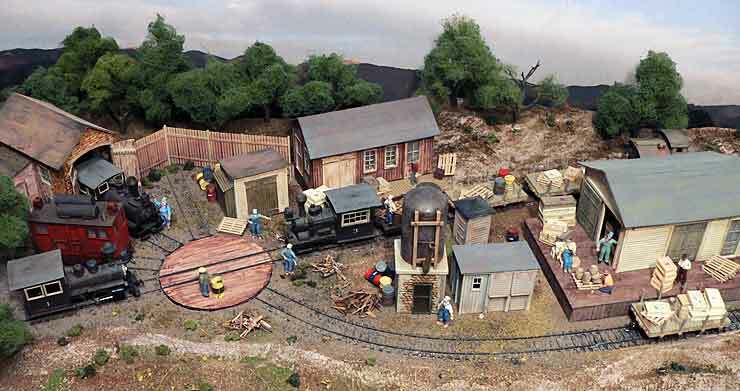 Andy has mocked up such a layout in Peco N-scale trackage (above right). In 1:25 scale the 9mm track would be very close to accurate gauge; but Andy figures that 1:24 (taking advantage of commmercial components) would be close enough. This is sometimes called Gnine gauge. Much of the rolling stock would be scratchbuilt to create this very-narrow gauge line with large people riding on it. But there’s now some commercial help at hand (see the referenced Gnine web site). Andy has also posted some ideas and information about building the line and its rolling stock. Geoffrey Tribe’s photo of the east terminus, looking west from the end of track, gives a good feeling for the cozy size and considerable appeal of such a line. 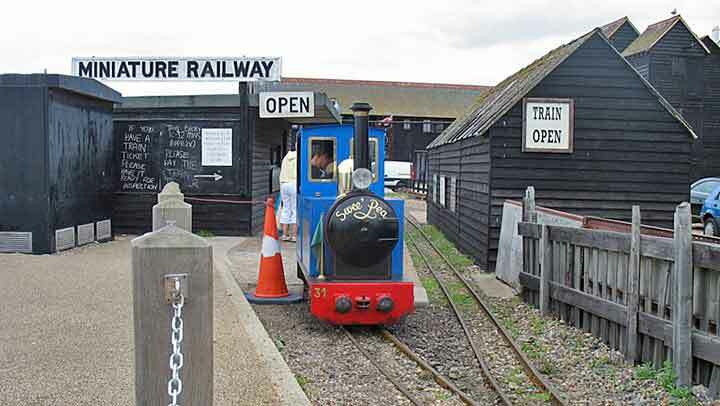 The Hastings Miniature Railway runs along the seafront, giving very nice views out over the water. And yes, it’s that Hastings — 1066 and all that! MODEL THE LOOOOOONGEST STATION IN GERMANY! 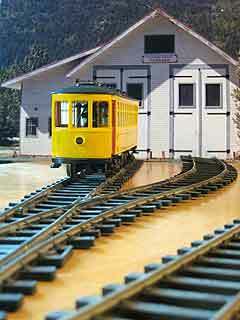 Frequent-contributor Herbert Fackeldey, from Aachen, Germany, sent along this description and suggested model of Zwinge West Station. Herbert reports, “This is the western part of Zwinge station which was split in two by the Iron Curtain [when Germany was partitioned]. 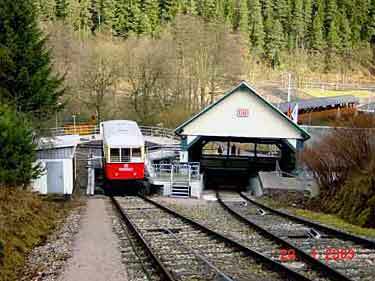 Some called it Germany’s longest station because it would have taken a traveller a detour of some 400 kms to get from Zwinge West to Zwinge East! “There was no runaround, so trains were pushed by the 93 class 2-8-2 tank locomotives for the last six kilometers at a brisk 15 kph. I have no idea how the wagons got into the siding because the headshunt [lead track] was just long enough for one four-wheeled wagon. Most likely, they were pushed by hand. Anyone for building a working capstan shunting drive? Brian explains, “I’m looking at an HO base layout of 48x36in [120x90cm]. It would be built like a dining table that is pulled apart for drop-in leaves. The drop-ins would be 36x18in [90x45cm]. 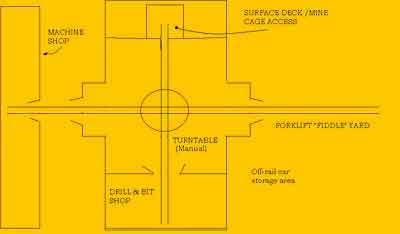 The drop-ins would be stored on shelves on each side and under the base layout. The drop-ins would include backdrops the same height as the center divider on the base layout. Once the drop-ins are in place, it would appear to be a seamless scene. By an amazing coincidence, I happen to own a Bowser eight-wheeled Brill car in O scale, and a motorized Corgi Birney in 1:50 scale (close enough!). So I enlarged Brian’s shot of the NET car barn, mounted it on heavy card, and threw together some old Rivarossi track (Code 110 rail, 32in [81cm] radius) in the carbarn approach track pattern used at Nelson. Results of this mockup are shown here. 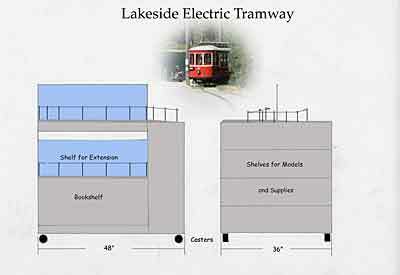 I liked the way it looked, so continued with designing an O scale version of the Nelson Electric Tramway (above left). This is 48x22in using 9in [23cm] radii for the end loops. The baseboard is divided by a low backdrop into three sections: the car barn scene, the fiddle yard, and a downtown scene. 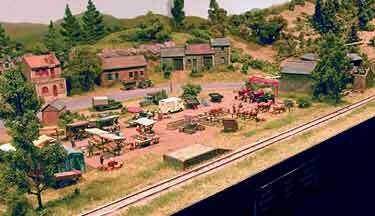 The fiddle yard allows entry of new cars onto the layout by placing them on the car barn tracks, from whence they can emerge perfectly naturally into the scene. 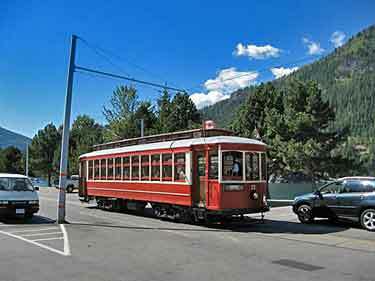 The downtown section of Nelson is modeled as it was a few decades ago, when the tram was still in regular revenue service. An authentic backdrop of low-relief downtown buildings can be enlarged from the patterns provided in the city’s website. The siding in the middle of Baker Street, of course, is used to make it possible to run two cars on the line! The Club de Modélisme de Draveil, located in the southern suburbs of Paris, has developed a method for squeezing more scenery into less space. They use two revolving scenery platforms to produce the three scenes shown here — in the same space! 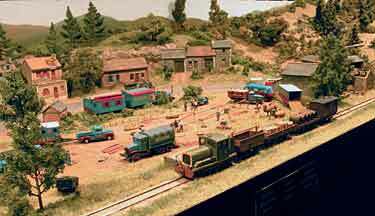 Herbert Fackeldey encountered this layout at the train show in Genk, Belgium, and took these photos. “The larger element is triangular in shape and displays three different scenes (market, circus, and an empty space with children playing). The other one is much smaller and has only two scenes (lorries and circus vehicles). It only needs to be turned if the circus scene is displayed,” Herbert explains. 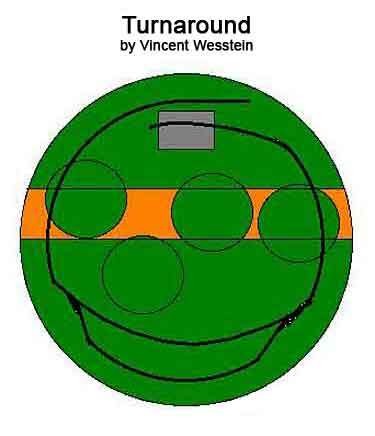 Vincent’s idea is very similar to the classic Jaxcilli Industries, by Jack Trollope, which uses just two cars that continually refill one another ad nauseum. Vincent explained that he purposely introduced a third car in order to make the exercise harder and more interesting for the operator. Peter Laband, from Redditch, England, sent along some photos and information about a “pop-up” railway layout book he received as a gift. Pop-up scenery is the kind that folds flat when the covers are closed, then magically takes 3-D form when the book is opened. This one is called “Choo Choo,” and Peter wonders whether the idea might have some application to an actual model railway. 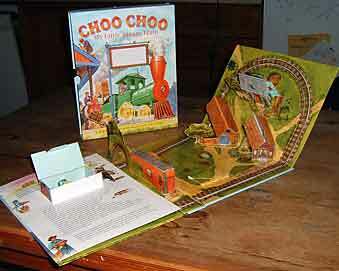 Peter describes his book this way: “There is a cardboard box with a window in it, through which you can see the little clockwork loco. The book slides out and has a story about the town on the inside of the two pages, and on opening out the village folds up. The loco is kept in a little loco shed that does not pop up but has a clear plastic floor so the loco can be seen from inside. “The track is printed on the card but simply raised in the middle to guide the loco, which is a clockwork 2-2-0 with a 2 wheel tender and goes ok for its size.” Has anyone created a “serious” layout with pop-up scenery? 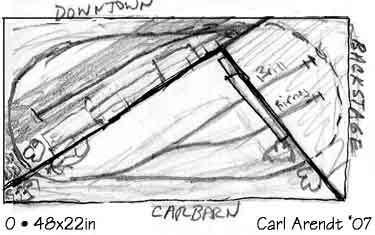 Bob Moroch, from Frisco, Texas, is building this 40x18in [101x45cm] On30 layout, Pine Creek, that has a most unusual trackplan. There are no track switches, just a very small turntable with some approach tracks. The photos show how the layout is coming along — Bob made full-sized printed paper mockups of all the buildings to adjust dimensions and details before he actually built the structures (you can see the paper enginehouse in the background at lower right, with the final enginehouse model at lower left). 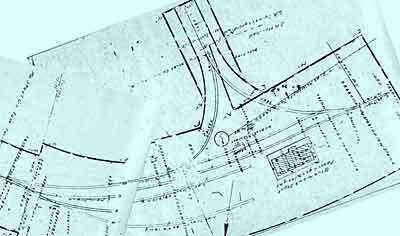 You might wonder, as I did, how such a track plan would work in operation. Here’s Bob’s description of a typical operating session (numbers refer to the track plan at the right). A train enters Track 5 from the right. It consists of Engine No. 1 and cars No. 1, 2 and 3. Engine No. 2 is in the Engine House and Engine No. 3 is on Track 1. Part 1. The object is to set out the three cars at designated locations. There are 5 locations to spot cars. Three locations are selected at random. The three cars are then randomly matched to the selected locations and the cars are then spotted. Engine No. 1 must end up at the Water Tower. 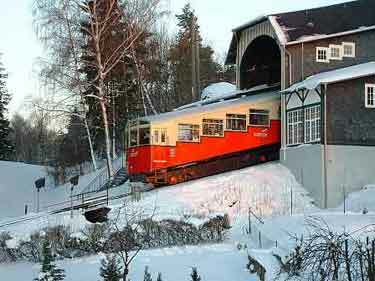 The turntable can only hold one car or locomotive at a time. Cars can be spotted by being pushed or pulled by any of the locomotives. Engines 2 and 3 cannot be left on Track 5 or 6. Part 2. Make up a departing train on Track 6 with Engine No. 1 heading to the right. Randomly select the order of the three cars. Engine No. 2 must return to the Engine House and Engine No. 3 to Track 1. Sounds plausible, and pretty challenging, does it not? For more information about this unconventional layout, including Bob’s method of making a turntable from a a four-inch PVC drain cap and grate, see his thread at the Free Rails Forum.